Details of the six NATO warships currently deployed on a circumnavigation of Africa are now available. The ships are scheduled to arrive in Cape Town from next Tuesday, 28 August for a five day visit. USS Normandy, a Ticonderoga class guided missile cruiser, which is the flagship of Rear Admiral Mike Mahon, Commander of SNMG1. In the latter part of the voyage somewhere in the vicinity of the Seychelles, USS Normandy will leave the group after handing over duties as flagship to USS Bainbridge, one of the Arleigh Burke class destroyers. Bainbridge is not currently part of the group. HNLMS Evertsen, a stealth type Zeven Provincien class air defence and command frigate of the Royal Netherlands Navy. FGS Spessart, a Germany Navy Rhone class replenishment tanker, acting in support of SNMG1 throughout the deployment. HMCS Toronto, a Canadian Halifax class multi-role patrol frigate. NRP Alvaras Cabral, one of several Vasco da Gama Meko class frigates in the Portuguese Navy. HDMS Olfert Fischer, a Royal Danish Navy Niels Juel class corvette. The six ships are due to make a five day official visit to Cape Town, and as far as can be ascertained this will commence on Tuesday, 28 August (our own navy as is the norm gives out very little information). A reception is to be held on board one of the ships in harbour. 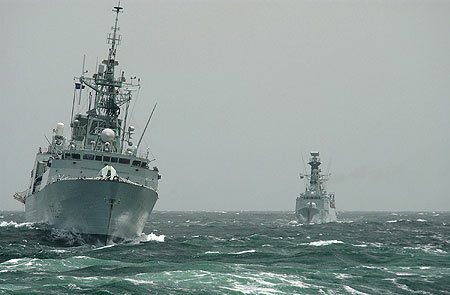 While in South African waters the NATO ships will take part in exercises with ships of the South African Navy. These exercises will include a series of seamanship and warfare serials which are designed to demonstrate the capability of NATO forces and the South African Navy to operate together, developing integration and operational skills. The respective forces will also conduct training and logistics support including replenishment at sea and helicopter operations. In the final stages of the exercises the ships will conduct more advanced warfare serials such as gunnery, anti-submarine warfare, maritime interdiction operations, including surface surveillance and situational awareness. NATO says it is expected that these more complex exercises will inspire mutual confidence and respect between NATO maritime forces and the South African Navy, allowing for even greater cooperation in possible future combined exercises or operations. “The South African Navy is a well respected and capable naval force that plays a vital role in protecting key international shipping routes around the Cape,” said Commander SNMG1, Rear Admiral Michael Mahon. It is not known which ships of the South African Navy will take part in the exercise. Of the four frigates SAS Mendi is off to take part in the Brazilian Bi-Centennial celebrations in Rio de Janeiro while SAS Amatola is due to return to South Africa after taking part in training exercises with the Royal Navy in UK waters and according to the port is due in Cape Town harbour on 4 September. The other two frigates, SAS Isandlwana and SAS Spioenkop are both in Simon’s Town as are the strike craft and two of the new submarines plus the replenishment ship SAS Drakensberg and one can expect most of these ships to take part.